Shellfish are festive, which is why so many people eat it this time of year. But not many people know much about it -- the main questions we get are "Is it wild?" Or "Is it fresh?" Sometimes it is, sometimes it isn't. I'll go through the various shellfish species and tell you what you should be looking for, wherever you're shopping for shellfish. SHRIMP: Frozen at the source, either PDV (peeled and deveined) so it's ready to cook, or EZ peel, with the shell still on, but split down the back with the sand vein removed. All of our frozen shrimp is raw, and needs to be cooked before eating. We don't regularly sell the shell-on shrimp with the head still on, because nobody eats the heads, so why pay for it? We do bring it in for people who have a recipe that calls for it, but most people prefer their shrimp headless. We go through hundreds of pounds of our cooked cocktail shrimp every year during the holidays. We cook both farm raised and wild shrimp, but most of what we sell is farm raised. We don't source our shrimp from certain areas of east Asia, because we don't feel that we can trust how the shrimp is handled or what they feed it. Our shrimp is mainly from small farms in Indonesia, an industry vital to the local economy. We cook it fresh daily, with our own blend of spices. It's delicious. Grocery stores very rarely cook their own shrimp - they buy shrimp that was cooked on a boat or in a factory and frozen, probably months ago, and thaw it out. Our PDV Gulf shrimp are wild, and also delicious, so if you just have to have wild shrimp, we have those, too. 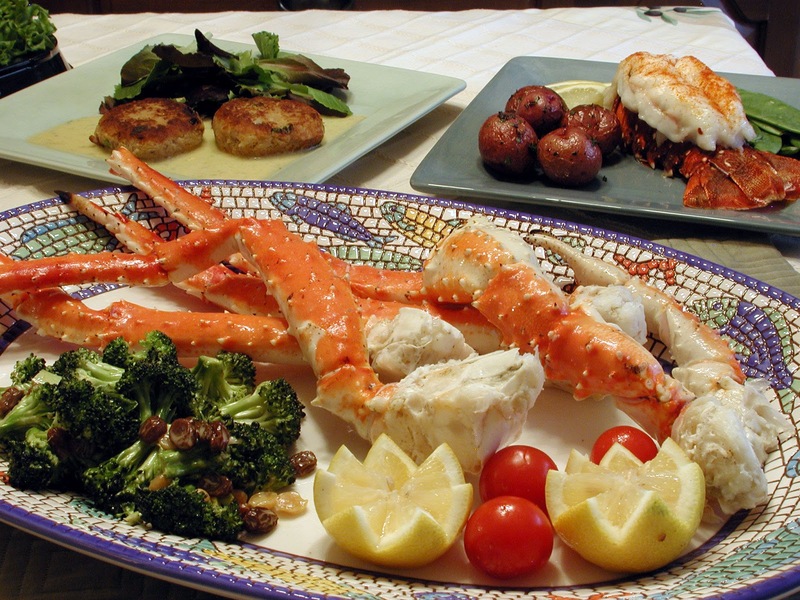 KING OR SNOW CRAB LEGS, CRAB MEAT: Crab is so perishable that it's pretty much all cooked right on the boat, then frozen. It is occasionally possible to get cooked crab legs that haven't been frozen, but since they're all pre-cooked anyway, it makes little difference. Crab legs just need to be re-heated. I thaw mine out first in the fridge over night, then I put them in a large roasting pan with a cup of water, cover the pan with foil, and steam in the oven for about 20 minutes at 400 degrees. I serve them with herb butter and lemon or our Lemon Dill Sauce. Crab meat also comes in cans - we get the restaurant-quality lump crab meat that needs to be refrigerated, a much higher grade of crab meat than the stuff that's packed to be kept on your pantry shelf. We don't recommend canned crab meat that doesn't require refrigeration. LOBSTER TAILS: Lobsters are nasty creatures that can't be farmed because they would kill and eat each other. That's why they put those rubber bands on their claws in lobster tanks - to keep them from lobstercide. We get ours from 2 sources, the northern US and Canadian East Coast, and off the coast of northern Australia. Once endangered, fishing regulations have helped the resource rebound -- females caught in traps get thrown back to reproduce, the males land on your dinner plate. 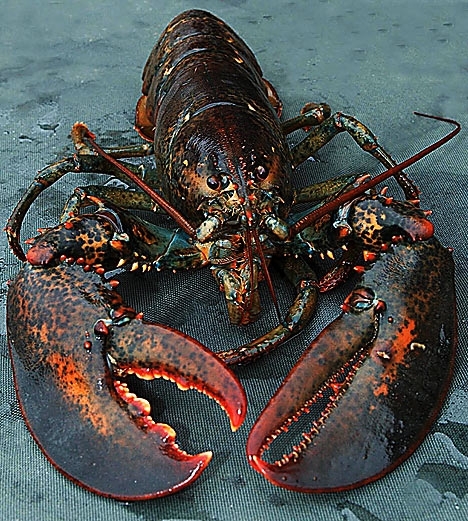 Lobster tails are frozen right after harvesting, and are shipped raw, so they need to be cooked, not just warmed up. Our North Aussie tails are harvested by aboriginal farmers off the coast of Darwin - they consider their lobster fishing areas sacred, and manage the fishery very well. SCALLOPS - SEA OR BAY: Sea and bay scallops (the smaller ones) are deliciously sweet in many recipes, but are the most confusing of all shellfish. They can be shipped and sold "fresh," but the packers are allowed to add chemical salts to the scallops, so that they hold their moisture and are preserved. This gives the scallops a strange, metallic taste, not very pleasant. The frozen, or "dry pack" scallops are the ones to buy - they don't contain chemicals. Scallops are harvested wild, which is very damaging to the sea bed, or they are being farm raised, like oysters and mussels. In this case especially, farmed is better for the environment. Other shellfish that's very perishable ships best alive, which means that you have to kill it in order to eat it. In fact, if it isn't alive when you cook it or serve it, you generally shouldn't eat it. 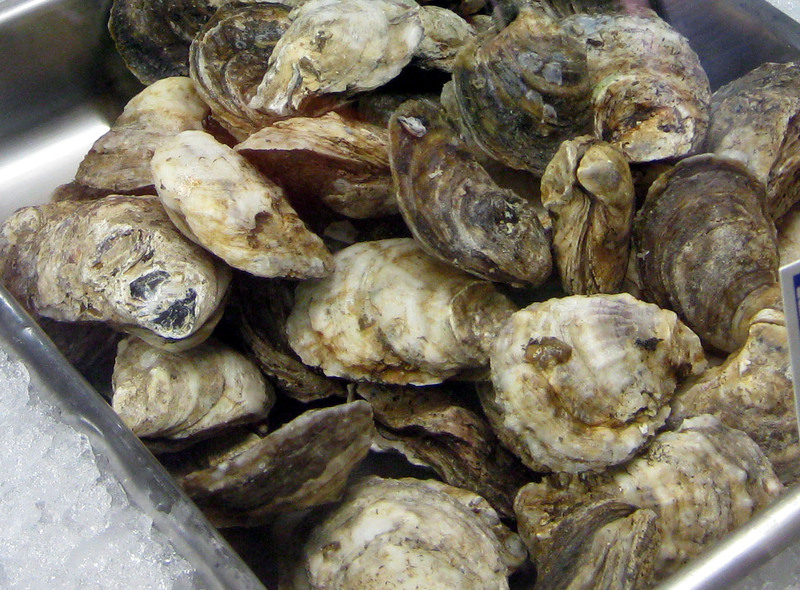 OYSTERS: We pretty much always have our East Coast blue point oysters, by far the most popular with our customers. The taste is sweet, they're not as hard to open as some varieties are, and you can eat them just as they are, or with a dab of cocktails sauce or a squeeze of lemon and a little hot sauce, or like the French with vinegar and shallots,. During the holidays, we get requests for other oysters, like Kumomotos from Washington State, and Malbec's from the East Coast. Pretty much all oysters are raised these days, because that allows the farmers to know that the water they come from is clean. They're raised in tidal waters, and the oyster grow on ropes that you can see at low tide -- if you ever get the chance to go to an oyster farm, it's quite a sight. The exception to the rule is our shucked oysters, which we sell by weight. These are meant to be cooked, not eaten raw, but it's much easier than shucking them when they're for stuffing or scalloped oysters, or any other cooked oyster dish. NB: Anyone with auto-immune issues should be very careful about eating any uncooked seafood. MUSSELS: Like oysters, mussels these days are almost all farmed, which is a good thing. I remember the days of de-bearding the wild mussels, an onerous task. They often contained sand and grit, not the most pleasant experience. Now the farmed mussels are easy to prepare, just rinse in cold water and drop them in a pot with your cooking liquid of choice. And everybody gets to eat with their hands. Just provide lots of napkins and crusty bread to soak up the broth. CLAMS: Like much of our shellfish in the US, stocks were horribly over-fished for years, threatening the resource, along with the problems brought by massive development along our shores, and with it massive pollution. The aquaculture operations that have grown over the past couple of decades are helping to preserve the wild resource, and provide us with a wonderful product. About 80% of our US clams are ocean raised. Unlike oysters and mussels, clams don't attach to ropes, they burrow into the sand, and have to be dug up. SOFT SHELL CRABS: Only available in the spring and summer, when blue crabs are molting, these little guys are shipped alive. They die when we clean them for you, right when you buy them, and should be cooked (or frozen) within 24 hours. These are one of the tastiest treats from the sea. They make a super great sandwich! Once cleaned, you cook and eat the entire beast. Because they've been over-harvested in recent years, supplies are less available due to restrictions, and prices have gone up. all you need to do is warm them up in the oven, or eat them cold - tastes great, either way! Check out our various How To videos (cooking lobster tails, opening an oyster etc.) by Clicking Here: Shellfish Videos. 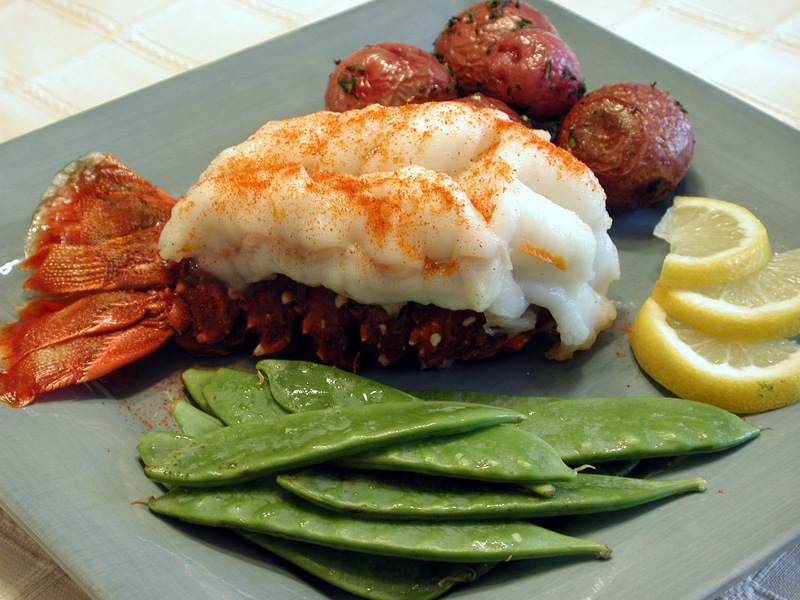 Our lobster tail cooking video has over 1,000,000 views!